So this is our Great Pyrenees puppy, her name is Pearl. At the time of this photo, she was about a year and four months, but she still had more growing to do, as is common for a giant size breed. And as cute as she may seem in this photo, all was not well at this point in her life. She’s still alive, don’t worry, I would do that to you on Christmas Eve! We’re pretty sure that she was the runt of the litter. We got her on a farm up in Oroville, and the day we went to go look at her, we didn’t get to see any of her siblings. She was the last one left. So at the time of the photo, she should have been much bigger. Not only that, but she wasn’t eating much. And so, even though she was still a puppy, she began to lose weight. On top of that, she started losing her hair, to the point that you could start to see her skin in some spots. You can tell in this photo that her hair is thin, and you can also see that her neck stands out prominently, and you could even see her ribs, spine, and hip bones stick out a bit. Like I said, all was not well for our little Pearl, and we were freaking out. The thought of losing another dog, so soon, was unthinkable! So after many visits to her doctor, many visits to the pet store to try yet another food, and many dollars later, we’ve finally been able to get her to a healthy weight, as you can see in this next photo. This was about 3-4 months later. And in case you’re wondering, this is at our annual animal blessing that we hold right out front of the church each year in the Fall. 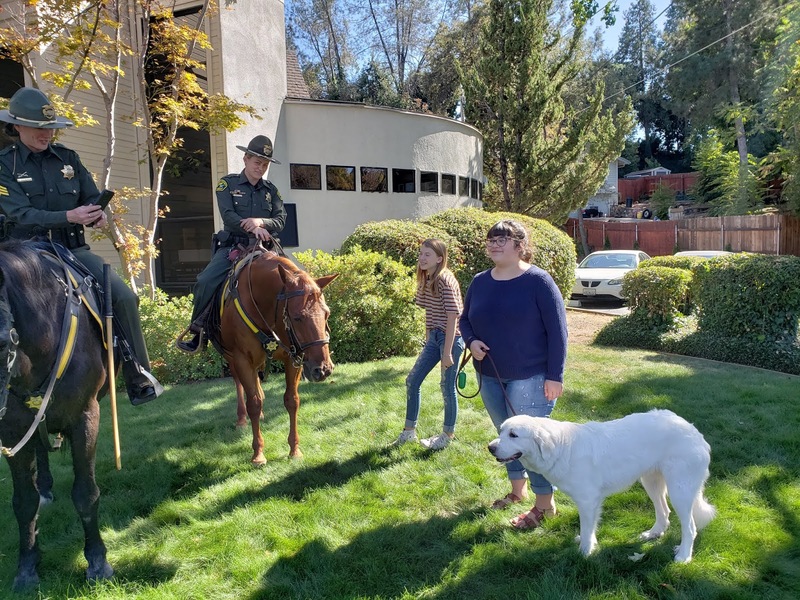 This year we had officers and their horses join us from the Placer County Sherriff’s department, and you can see Pearl hamming it up as they all wanted a picture of her. We’ve never really pinpointed the problem but her doctor says she’s probably done growing, even though she is small for her breed. She still struggles with her appetite. But she is healthy, and very spoiled. Not by me of course! So, other than another excuse to show puppy pictures, why am I talking about Pearl? Well, I’m glad you asked! It got me thinking about a word that my kids absolutely hate when I use it: flesh. Any use of that word is unacceptable to them: flesh, fleshy, fleshed out. They hate it! So I use it any chance I get. And I thought, why not write a sermon about it, so here it goes. To me, it’s a positive word, not a negative or creepy one, or whatever they think it is. 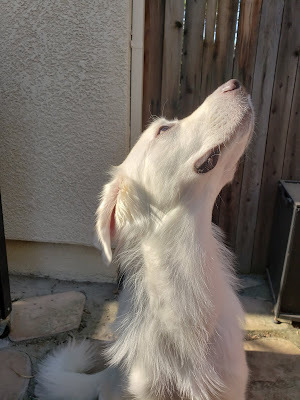 When we were worried about Pearl, we made it our mission, to put some flesh on her, to put some meat on them bones, to fatten her up, however you wanna put it, she needed flesh, and it was our job to help her get it. Now, what in the world does this have to do with Christmas? Another great question! Y’all are brilliant, I’m tell’n ya! Over the past four months here at Bethlehem, we have been reading the great stories of the Hebrew scriptures. We started back in Genesis, and read some of the most fascinating stories, ending with the prophet Isaiah just the other week. Now we are reading through the Gospel of Matthew til Easter. And those ancient stories were full of hope, and promise, and God’s presence throughout. There were also stories of heartache and loss too. But tonight, we read another ancient story that was closely connected to those from the Hebrew scriptures. Because, now it was time to put some flesh on that hope. Now it was time to put some meat on those promises. And it came in the form of a fat little baby, born to a poor middle-eastern couple, in a smelly old stable. That’s how God decided to flesh out the hopes and dreams of the world, that’s how God put meat on the bones of those promises made thousands of years ago. So, here’s the meat that I want you to chew on as you leave this place tonight. Where does God need to put flesh on you? What part of your life is a bit scrawny? What part of your life has been neglected? What part of your life has bones showing through? Maybe in your spiritual life? Maybe not. Maybe in your professional life? Maybe not. Maybe in a particular relationship? Maybe not. Only you can tell. And once you are able to name where you need fleshed out a bit, how will you do it? Well, if there’s anything that these old stories tell us, it’s that God has been in the hope and promise business for a long time! And God has been in the fleshing out business, the putting meat on bones business for a long time. God’s kind of an expert at this. And how does God do this? Lots of ways! Through the amazing people that God has put in your life, those that care for you, love you, especially those that love you enough to correct you when needed. Maybe it’s been a mentor, a friend, an inspirational book, heck, maybe lessons of unconditional love that your dog has taught you. God can use anything God wants to put some flesh on your bones. But let’s not confuse this with God’s love for you. God already loves you! God has loved you from before you took your first breath! And God could not love you more than God already does! This is about living life to its fullest, its fleshiest. Ok, I heard it that time, that was a little creepy. And by fullest I don’t mean that life is all about you. Which leads me to one last thing I’d like you to ponder, to chew on. Bethlehem needs your help. And no, I’m not talking about your money, although little churches like us could always use more of that. And I’m not talking about your Sunday attendance, although, you’re always welcome. What I’m talking about is bigger than that even. I’m talking about leaving this world a better place than the way it was given to you. Maybe you’ve noticed, but the world isn’t a perfect place, far from. So, as you look around at your world, I want you to look for places that need some flesh on their bones. Now, you can take that very literally, which is why tomorrow we are having our 30th annual Christmas dinner right here at Bethlehem. If you know of anyone that needs a meal tomorrow tell them to come on by. Or you could also take that figuratively. As you look at your world look for places that are starving in other ways. There are segments of society that are being treated unfairly and are starving for justice. There are groups of people that are persecuted and are starving for freedom. Or maybe it’s a neighbor who is lonely; a family who can’t afford to give their children a Christmas; or someone whose holidays are particularly difficult these days. God has given you eyes to see the needs of this world and put flesh on them. Use them—in the same way that God looked upon on our needs, and put flesh on our hopes and dreams in the form of a little baby, in another Bethlehem long ago. Merry Christmas dear friends. Amen. Last Sunday we wrapped up our journey through the Hebrew scriptures with a passage from Isaiah. The prophet encouraged us to persevere, even though it had been a long and winding road, because God had not forgotten the promise to be our God through thick and thin. And Isaiah ups the ante with another promise, a promise that God’s very own servant would bring justice to this world, with us, and do it through peace, not by force. Not what they were expecting to hear but if that journey through those ancient stories taught us anything it’s that God is full of surprises, am I right? God does what God wants to do. God fulfills promises however God wants to fulfill them. God doesn’t have to follow any rules! You’d think by now, we’d have figured that out. And I know that many of you know exactly what I’m talking about because I have heard so many stories from you, about the amazing and surprising ways that God has worked in your lives, answering prayers in the most unexpected ways. However, sometimes when God does that, it’s not all roses and tulips, as is the case in our reading for today from Matthew. 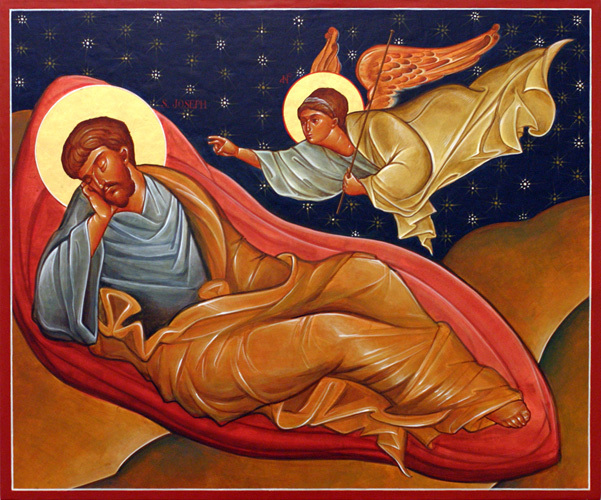 Before we get into that, one thing that I really love about Matthew’s telling of Jesus’ birth story, is that he tells it from Joseph’s perspective. Luke’s telling of this story is from Mary’s perspective and that’s the story that we always read, every year on Christmas Eve in fact; including tomorrow night. But we only read Matthew’s version every three or four years and so it isn’t quite as popular. And as such, Joseph usually takes a back seat this time of year, which is ok, Lord knows that the men of this world have had their share of the spotlight. But this story of Joseph is pretty profound, and so I’m glad we get a chance to talk about it. So, speaking of surprises, Joseph gets a doozy in this story! Here he is, engaged to be married to a wonderful young woman; he’s planning his life out like any of us would; supporting his young family with his carpentry business; life is good for Joseph. And then bam! Mary gets pregnant, and he knows the baby isn’t his. His whole world fell to a pile of ashes at his feet. And like many of us, he thought, well, that’s that. It’s over before it even began. You see, according to Jewish law, the punishment for adultery was execution by stoning. But Joseph could not allow that. So, he devised this plan where he would leave her quietly. Just walk away. Dreams crushed. Say goodbye. Call it a day. And so, Joseph goes to bed that night, to begin dreaming new dreams, of a different life than he had expected. And you know, can I just stop there and say that it’s in instances like this, that God really shines sometimes isn’t it? When life has had its way with your dreams, crushed them, pulverized them, and you see no hope, that’s often when God steps in and says, I’ve actually thought of something that you haven’t—believe it or not!—If you’ll just hear me out. And that’s what God asks Joseph in his dream that night. God knows that this isn’t the dream life that Joseph had planned but if Joseph will just hear him out, there are things at work here that he’s not aware of, and so God let’s Joseph in on some insider information. That in fact, Mary had not cheated on him, but the child was put there by God. And God had big plans for this baby. And Joseph got to be a part of that, if he wanted to. Because Joseph could have said no. He could have said, you know, thanks but no thanks God. I’ve had about all the drama I can handle right now. I’m good. That’s what I would have said. But not Joseph. However, I would have loved to see the look on his face as he woke up from that dream! Was his expression that of pure terror? Relief? Heavy responsibility? Shame? All of the above? Regardless of his expression, he got up from that dream that morning, and said, ok, let’s do this. It’s not the life I had dreamed for us, but if raising someone’s else’s baby is what I’m being asked to do, then so be it. And I don’t mean to over-sentimentalize this story but, it’s hard for me to read this story and not believe that Joseph was able to say yes to this dream of God’s, because he loved Mary. That this was not just an arranged marriage, this was not just two people carrying out a societal norm, but in order for him to go along with this plan, he must have already loved her, deeply. I believe Joseph is one of those rare male characters in the Bible, who is just a plain ol’ good person, through and through. So many other male characters in the bible force us to overlook characteristics about them, certain behaviors, attitudes, etc., but with Joseph, other than his plan to quietly leave her, which I personally don’t hold against him, he provides a great model for us, of how to love someone, unconditionally. There was a lot that Joseph had to look past in order to love this new family that he found himself in. He had to look past the fact that this baby was not biologically his. Mary could have easily been a constant reminder of the life that he had dreamed but now lost, every time he looked at her, if he allowed himself to. This act of love on his part was a conscious, intentional, sacrificial, act of love. And I have to wonder, if it was that kind of love, from both his parents, that allowed Jesus to take on the cross so lovingly. But back to Joseph, the other thing that I really wanted to point out from what he can teach us about love, is the way that he was able redefine what family meant. He took this baby in as his own, even though it was not his blood. And I don’t think I have to tell you how being a blood relative is important to humans. It was just as important in Jesus day as it is today. 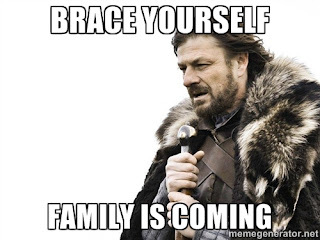 Whether you’re talking about family inheritances, or who is eligible for the throne, being a blood relative has always been extremely important to us humans. I’m sure there is a scientific explanation for that but I’m no scientist. Point is, none of that was more important for Joseph than this call to raise this baby as his own, to call him family, and to be the best dad and husband that he could be. And this was an important lesson for him to learn because this baby, this savior of the world, this ruler of the cosmos, wrapped snugly and lying in a manger, did not just come for his family, or the Jewish people, but for everyone. As you continue to chew on this throughout your upcoming Christmas celebrations, I want you to consider how you define family. Who do you include? How does one become eligible to be included in your family? What are the prerequisites? What is different about the way you love those whom you consider family and those whom you do not? And more importantly, is there something you can learn from Joseph about how you define family? In other words, however wide your definition of family is, are you able to widen it just a bit? Can you dream of a world where all our definitions of family became a little wider? Can you dream of that happening on a global scale? God invites us into this dream. And if we’ll just hear God out, maybe we can wake up in the morning, and like Joseph, say, ok, let’s do this. Amen. We finally made it! Today is the last reading from the Hebrew scriptures. Beginning next week our readings will come from the Gospel of Matthew and we will read right on through that book until Easter. It has been a long and winding road through these old, old stories. Some of you will miss them, some of you will not. I’m somewhere in between. I’ve really enjoyed the opportunity of preaching on these old stories which I don’t usually get a chance to. But I am also very much looking forward to reading from the Gospels again. We started back at the beginning of September with the story of the Flood and quickly moved to stories from the family of Sarah and Abraham—stories that laid the foundation for the rest of our readings since then. All of which, in turn, have laid the foundation for our upcoming readings in Matthew. In particular, I’m reminded of the promises that we have heard. In the story of the flood, God promised to stick with this creation, faults and all. And in the story of Sarah and Abraham, God tells us how God will do that, with another promise, through Sarah and Abraham’s family. God told Abraham, “I will make of you a great nation and will bless you…All the families of the earth will be blessed because of you.” You may remember that Sarah and Abraham had a difficult time leaning into that promise. It was difficult for them to see how it could really come true. But that’s because they weren’t looking at it using the right lens. It’s like trying to drive with reading glasses on. Nearly impossible! Reading glasses are for seeing things up close, right in front of you. However, this promise, couldn’t even be seen with distance glasses on, they needed more like a telescope! No, they needed more like a crystal ball that could see into the future. You see, even though this promise did, in part, come true in Abraham’s lifetime, the promise was even bigger than they could have imagined. It wouldn’t be completely fulfilled for well over a thousand years! And in that time, God’s people would travel that long and winding road, filled with twists and turns, ups and downs, celebrations and tragedies. At some points it would seem that the promise had been fulfilled and then at other times they couldn’t even remember what the promise was. They had been thrown into slavery and rescued from slavery. They had seen the rise of their kingdom only to see it fall. They had been exiled out of their homeland and been allowed to return generations later. So much time had passed from those first promises to this point in their history, that Isaiah finds it necessary to remind them of what this long and winding road has been about. The promises had not been forgotten. They had not been fulfilled yet either. They were still in the making. And God’s people, like their ancestors before them, were witnessing it in real time, even though it was hard for them to see. In our reading for today, the prophet Isaiah reminds them of their calling, and that calling is a calling to servanthood. But God, through Isaiah, begins by telling them about a particular servant. The identity of this servant of God’s is left ambiguous, mysterious. And for the next thousand years or so, Jewish theologians left it that way. However, even though Isaiah doesn’t identify who it is, he did give a pretty detailed description, characteristics of this particular servant. This servant is upheld and chosen by God, which God’s own spirit rests upon. And this servant will bring justice to the nations, but probably not in the way that we would expect. When we think of someone bringing justice we think of power and might, maybe even by force, like an Arnold Schwarzenegger or the Rock. But that’s not the figure that Isaiah paints here is it?. This servant will bring justice while not shouting, while not making his voice heard in public, while not breaking a weak branch or blowing out the weak flame of a candle. And yet, God says through Isaiah, that he will surely bring justice, and he will not be extinguished or broken until he does. Now, this may very well be why the identity of this servant was left a mystery, because who could possibly fit this description? Who could bring justice in this way—so quietly, so unpretentiously, so peacefully? This is not where we thought the long and winding road was going to lead! But it’s no wonder that so many Jews saw Jesus and made the connection to passages like this. God ends the description of this servant by saying that the coastlands await his teaching, not just him, but his teaching. And that’s when there’s a shift in God’s words here. God goes from speaking about this servant, to speaking directly to God’s people, saying, “I have called you for a good reason.” And before there’s time to get frightened by that prospect, God reassures by saying, I will hold your hand, and I will guard you. Having said that, God goes on to spell out what this calling is—to be sent as a promise to the people, as a light to the nations—so that blind eyes will be opened, prisoners will be set free, and those sitting in darkness will be liberated. 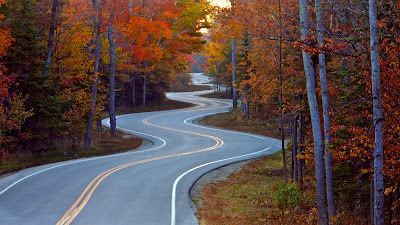 All while holding our hand, down a long and winding road that just seems to have no end! Before the weight of that responsibility crushes us, I am reminded of the words of Rabbi Tarfon, who was a Jewish sage during the same time that the Gospels were being written. He wrote, “The day is short, the work is heavy, the workers are lazy, the reward is great, and the Master is insistent. However, do not think that you alone can finish the work, but you aren’t free to desist from it either. Know that you are part of the living chain of people who have dreamed, worked for a better world, and carried on this mission, for four thousand years in an unbroken promise.” And that was 2000 years ago when he wrote that! Our Jewish siblings can certainly commiserate with us on this long and winding road. Whenever this work of justice that we are called to in this text becomes daunting, we would do well to remember the description of a servant that God gives us. We are called by God, the one who created the heavens and the earth, and that should count for something. We are promised God’s very spirit in this work. Not to mention that God will hold our hand and guard us in this work. And let us also remember that this work sometimes entails big tasks like working for social justice, whether that means donating to your favorite cause or protesting in front of a politicians office. And sometimes it’s in seemingly small tasks, like being the best parent or spouse or friend that you can be. The world is waiting for the servant’s teaching, for Christ’s teaching, and we have been tasked to deliver it. Thankfully, we are not called to do this work in a way that brings attention to ourselves, or alone, but rather we are called to do this work in our everyday lives: unpretentiously, peacefully—with Christ. Be patient dear friends, it is a long and winding road indeed, but it is a road with a promise, it is a road with God, as these ancient stories have assured us. Thanks be to God. Amen. I know I say this about a lot of Bible books but I’m serious this time, if you have not read the book of Esther in its entirety, you must put this on your reading list! It’s a pretty quick read, only ten short chapters but it is one heck of a story! It reads a lot like a twisted fairy tale, as you read it, you’re almost waiting for a dragon or knight in shining armor to appear. Spoiler alert, neither shows up. But that’s because Esther doesn’t need a knight or dragon to come and save the day, she has that well under control. How many of you have seen the movie The Princess Bride? For those of you who haven’t, what are you even doing with your life? Kidding! Hey, I wouldn’t be doing my job as your pastor if I didn’t shame you for something! Anyway, this story of Esther is like a sexist version of The Princess Bride with a twist of genocide thrown in for good measure. Like I said, it’s a crazy story! You won’t be disappointed! However, that’s not all that makes this book so interesting. It is the last book that made it into the Jewish Bible. In fact, it almost didn’t make it at all! And here’s why, there is no mention of God in the entire book. And that was a huge hurdle for the assemblers of the Jewish Bible to get over. And it’s hard to blame them, I mean, if the Bible is supposed to be a collection of books that help our own journey with God, it makes sense that the book has to at least mention God in order to make it in. But I’m sure glad they were able to overlook that in this instance. Because allowing it to be included in the Bible, without any mention of God in it, communicates something in and of itself. That tells us that there are many ways for us to communicate what we believe about God to others. It opens doors, opportunities to share God’s love with others in more subtle, nuanced, and creative ways—but more about that in a minute—let’s talk about the actual story first. Though the book is 10 short chapters, we’re only going to cover the first four today. What I read a moment ago was chapter four but let me first catch you up. Last week’s reading came just before the exile, when God’s people were conquered and forcibly removed from their homeland, being dispersed throughout the Babylonian empire. Then, after many years, the Persians conquered the Babylonians, because there’s always a bigger fish, and the Persian king decided to allow the Jews to return home. However, not all of them did, remember, this is generations later and wherever the exiled Jews ended up, was now their new home—which is why our story occurs in Persia, where Esther was born, and the country she calls home. Unfortunately, like many countries who have a diverse population with many people from other countries, comprised of many different ethnicities, racism was alive and well in Esther’s Persia. And that’s actually how we get this amazing story. So the book starts out with some turmoil between the king and queen of Persia. Queen Vashti was very beautiful and the king, like any misogynistic ruler, liked to show her off any chance he got. And so, a habit of his was to call her whenever he was having a party or hosting other world leaders, so that they could all look at her. Well, Queen Vashti had enough of that nonsense and finally refused to come when she was summoned! Well, you’d have thought she was caught with another king! The whole palace was thrown into turmoil! Then they had to decide what they were going to do with this disobedient queen! Do we try her for treason? Do we execute her? This part is pretty comical really. At one point, the king’s leaders tell him that they have to punish her in some way, because, if they don’t, all the women in the kingdom will think they can do whatever they want! It’ll be total chaos! So the king decides, like any mature ruler, to just get a new queen. That’ll teach her! He really was an idiot. 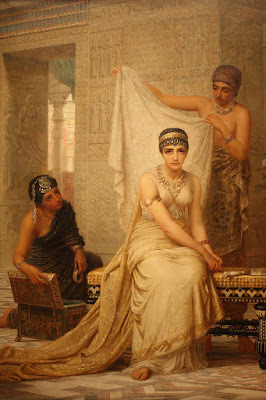 So he tasks his servants with finding the most beautiful young maidens, collects them all in one place, like they’re trading cards or something, and then they would undergo a year’s worth of treatments, with creams, oils, perfumes, etc., to make them as pleasant as possible for the king. Then, after their year of treatments, they were ready to be called to the palace for a night, to “audition” for the role of queen. This is where Esther enters the scene. She was one of these young maidens who was summoned to the palace on one of those nights, after which the king chooses her to be the next queen. However, this young maiden turned queen, had a secret, a secret that she hadn’t shared with the general public. She had lived her life hiding the fact that she was Jewish, due to all of the racism that Jews had to endure. Her family thought it best to hide that part of herself, for her own safety, and so that’s what she did. And for those of you who have not had to endure racism, that may seem pretty extreme. But believe it or not, people of color still do this in a variety of different ways. Especially those who are light-skinned enough to pass as possibly white or multi-ethnic, or to those of us who don’t “sound” like a person of color. Let me give you a couple examples from my own life. As proud of my last name as I am, there are times when I ask for it not to be used; maybe it’s for a flyer we are creating for a church event, or even on my business card that some of you are fond of handing out. You won’t find my last name on it. Why? Because I don’t want any stereotypes of Hispanic names to be the first thing that comes to a person’s mind when they see it, especially in association with Bethlehem. I would hate for that to be why someone doesn’t come and check us out. Here’s another one, when my wife Sara and I are house hunting or car shopping, I always ask that she be the first face they see. Again, so that any stereotypes that may come into play, at least won’t come first. Now, for those of you who haven’t had to endure racism, that might sound extreme, maybe even a little paranoid. I have one request of you, on behalf of every person of color living in an extremely racist society, please don’t draw those conclusions too quickly, especially knowing that you haven’t and will never walk in our shoes. But back to our story. At this point, the story takes a very serious, tragic turn. Through a series of unfortunate events, the details of which I’ll let you read for yourself, the king finds is necessary to decree that all the Jews have got to go. And I don’t mean that he wanted them to move—he wanted them dead—and so the royal decree commanded all the people in the kingdom to “wipe out, kill, and destroy all the Jews, both young and old, even women and little children.” Oh, and it also ordered their property to be seized. Sound familiar? For Esther, this meant that she was now faced with a choice. She could keep her identity secret and remain alive. But she also realized that she may have an opportunity here to save her people by using her position as queen, if she revealed her true self. This is where our reading jumps into the story. Her family warns her that this is a dangerous idea, that she should not assume she will be given leniency just because she is queen. I mean, look at what happened to the last queen and all she did was not come when summoned! Not to mention the fact that there was this law that people could only go to the king when summoned. To arrive otherwise was a death sentence. In spite of the danger, Esther could not bring herself to remain silent while her people were exterminated. Even if it meant her own death. And so that’s what she does. She goes to the king to reveal herself and ask for mercy on behalf of her people. And what does the king do? Well, you’ll have to read that for yourself! What a wicked pastor I am! I’m telling you, you won’t be disappointed! It plays out very dramatically with lots of theatrics! I really do want you to read this for yourself. But also, what the king ultimately does isn’t important to this sermon. What I want you to chew on from this half of the story, is the hidden nature of God. Remember, God is never mentioned in this story directly, but knowing scripture like we do, and knowing Jesus like we do, it’s nearly impossible to read this and not see God’s influence throughout this entire story. I mean, where do you think Esther’s willingness to die on behalf of her people comes from? If that doesn’t have God written all over it I don’t know what does! Why? Because God is revealed not only in words, not only in the naming of God, but also in actions, especially in sacrificial actions, in actions that cost us something. You know the old phrase, “actions speak louder than words.” Well, in the case of the book of Esther, actions speak louder than God! And I believe that allows God to shine all the more radiantly through this old, old story that never mentions a word about God. And my hope, is that it allows us some breathing room in our own ministries, in our own faith walks, as we discern where to be vocal about our faith and when our faith is simply calling for action. I think it’s easy for us to be pretty hard on ourselves for not being as vocal about our faith in public as we think we should be. In this story of Esther, I hear a different calling, a call to act, to put our money where our mouth is so to speak—to allow our actions to open the door for God to shine, brightly, into a dark world. Maybe the real challenge here, and why I love this book so much, is figuring out how to communicate God’s love, without using words, using only our actions. May we be ever ready, especially in the chaos of this Advent and Christmas, to speak God’s love without words. Amen. Advent is finally upon us. It is probably my favorite season of the church year. I think that’s because it’s so counter-cultural. While the rest of the world is in full crazy Christmas mode by this time, Advent whispers to us, ever so gently, “Hey, slow down. Christmas isn’t here yet. This craziness, isn’t Christmas. There are other things to attend to besides these things. But Advent is different things to different people. For much of the world, it is simply the chaotic month leading up to Christmas that exploded on Black Friday. In the liturgical life of the church, it is a season of hope, a season of waiting, a season of calm, in spite of how the rest of the world experiences it. It’s the eye of the storm, filled with peace and comfort. But for many, even us, it is anything but a peaceful time. It is filled with busyness, with frantic shopping, with social events, with financial burden, and of course, no Advent would be complete without family drama: Where will we gather for the holidays? Who’s cooking? How are we getting there? If he starts talking politics I swear I will leave! Ah yes, family drama at its finest. And we haven’t even got to Christmas yet! Families argue. Couples fight. We stress out at this time of year. It’s natural. It’s normal, mostly. And most of us get over it. We makeup and move on, or at least we move on. We do that because we love each other. All of this is why this reading from Habakkuk is so perfect for this first Sunday in Advent. I’m going to be honest with you though, when I first read it, I didn’t like it. And I had no idea what in the world I was going to do with it! But then I remembered Advent and all that this season entails, good and bad, and I realized that this reading from Habakkuk had all the ingredients that we need. It’s full of arguing, and it’s full of hope. It has a sense of despair, and it contains a promised future. It is full of juxtapositions and dichotomies, just like Advent is. So let’s dig-in to Habakkuk. To give you a little background, Habakkuk was a prophet along with Jeremiah in the city of Jerusalem just before the exile, just before the Babylonian empire conquered and sent God’s people out of their homeland. And by this time it’s too late for the city or the kingdom to be saved. Unlike Jeremiah from last week, Habakkuk is not there to tell them how they can escape destruction. The prophet doesn’t hold back. He takes this complaint to God like it’s a lawsuit. I imagine Habakkuk red in the face, trembling, practically foaming at the mouth, as he yells at God at the top of his lungs! “How long, O Lord!” How long? And then God answers. And lo and behold, it’s probably not what he expected. I mean, if I yelled at one of my parent’s like that as a teenager, I’d have been popped in the mouth! But not Habakkuk. He was probably expecting to be struck down by a lightning bolt right where he stood. But that’s not what God does. Now don’t get me wrong, I imagine God responding with a raised voice too, but with passion, not so much with anger. God begins by confirming their worst fears, that the Babylonians will indeed invade and conquer. Not exactly the news he wanted to hear. And so, Habakkuk and God continue this back and forth argument. Then, Habakkuk says, ok, I’ll keep watch, and see how God will respond to my complaint. And God responds, again probably not the way he wanted God to respond. He wanted an immediate solution, an immediate rescue out of the predicament they were in. But God, always full of surprises, instead says, “There is still a vision.” A vision for the future. Always the optimist our God is. But in the moment, I’m sure that was not comforting to Habakkuk or any of God’s people. “A vision?” they probably thought, “We don’t need no vision statement right now God! We need rescuing, right now!” But God is relentless in this hope business! It’s almost annoying really. No matter how dire the circumstances, God never tires of delivering hope. So God continues, “If [the vision] delays, wait for it; for it is surely coming; it will not be late.” In other words, whenever it arrives, it will arrive exactly when it was supposed to. It’ll be right on time! And Habakkuk, always the realist, takes a look around at the predicament they find themselves in, at the fig trees that don’t bloom, bare vines, withering crops, unproductive fields, abandoned sheep, and lost cattle—a very bleak picture he paints—and he too responds in a very surprising way. After painting this bleak picture, the prophet Habakkuk says, “I will rejoice in the Lord. I will rejoice in the God of my deliverance.” And I thought to myself, “Rejoice? How can you rejoice Habakkuk? Everything is falling apart! Nothing is going right! And you’re rejoicing?” I went from arguing with God over this passage to arguing with Habakkuk! And that’s when I realized some things that I can rejoice in, when I’m in the midst of turmoil and anguish and arguments with God—that I have a God who welcomes those arguments, that I have a God who wants me to name my complaints, to take God to task when things aren’t going right, that I have a God who will not stop giving me hope, no matter how much I may not want to hear it in the moment! Because God is relentless in this hope business. As we dive headfirst into this Advent, with all its chaos, stress, debt, and family drama, my hope for us is this: that we can accept the hope that God continues to give to us, that we can believe the promised future that God continues to proclaim into our lives, especially when things look bleak. That no matter what, no matter if everything this Christmas isn’t perfect, no matter if we couldn’t give all we wanted to give to our loved ones, no matter if all the decorations went up, no matter the family arguments that will indubitably ensue, Christ will come to us, Christ has come to us, and Christ will continue to break through all of that to be by our side. In spite of it all, Christmas will come. Now that can fill you with a sense of dread, but my prayer for you, is that it fills you with a sense of relief, when you need it the most, and with the prophet Habakkuk, be able to rejoice in those moments. Amen.